If you are using WordPress for your website, surely you know that you need a high-quality hosting solution to ensure the speed, performance, and security of your website. And don’t forget the importance of superior support. After all, anytime you have an issue with your website you want to know that getting in touch with someone who can help is just a click or call away. If your website is well-trafficked, and you believe you are in need of managed website hosting, it is important you do your research to find the perfect solution. That’s because not all hosting providers are created equally. And, depending on your individual needs, what works for some may not be suitable for you. That’s why today we are going to take an in-depth look at one of the most popular WordPress hosting solutions on the market – WPEngine – in an effort to help guide you through your research of the best managed WordPress hosting providers out there. Created in 2010 by Ben Metcalfe and Jason Cohen, WP Engine seeks to fulfill a mission many hosting providers don’t. For example, they seek to learn from their mistakes and become better as time goes on, are dedicated to providing their customers excellent support, seek to celebrate internal success and encourage a high team morale, are always looking ahead at long-term growth, and lastly wish to give back to the WordPress community in any way they can. WP Engine knows that technology, expertise, and innovation will create success for their clients. Technology. Enjoy an exclusive caching mechanism, EverCache, take advantage of a CDN for faster content delivery, and scale as big as you need to thanks to WP Engine’s increasingly advanced and powerful hosting plans. Expertise. 24/7 support is the norm for the team at WP Engine. Staffed with WordPress experts to answer any questions you have via live chat or phone, you never have to worry about excessive downtime or troubleshooting issues. Plus, WP Engine loves to hear your feedback so they can continually evaluate their customer service and make improvements. Innovation. Security is always going to concern website owners, whether their blog has a tiny following or millions of unique visitors a month. WP Engine provides you with updated installs and patches when needed, real-time security threat monitoring, and implements several prevention measures so your data is protected at all times. As you can see, WP Engine is a professional managed hosting provider willing to give clients everything that is needed to run a successful WordPress website, no matter the size or demands. 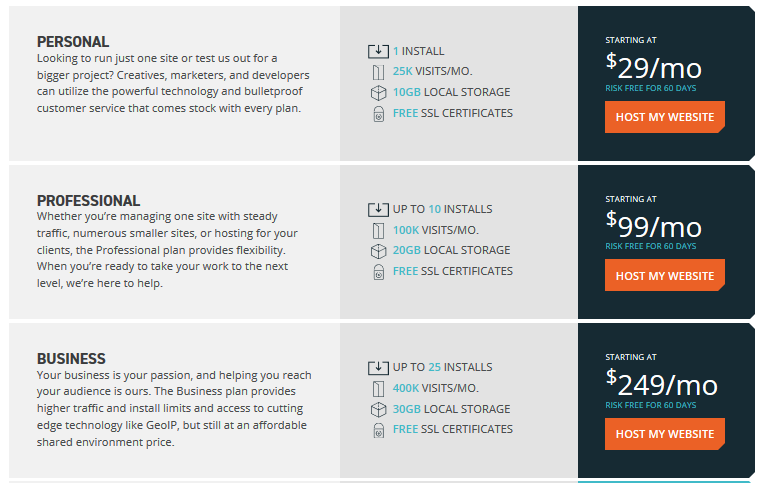 Let’s see what investing in WP Engine’s managed hosting services will get you. 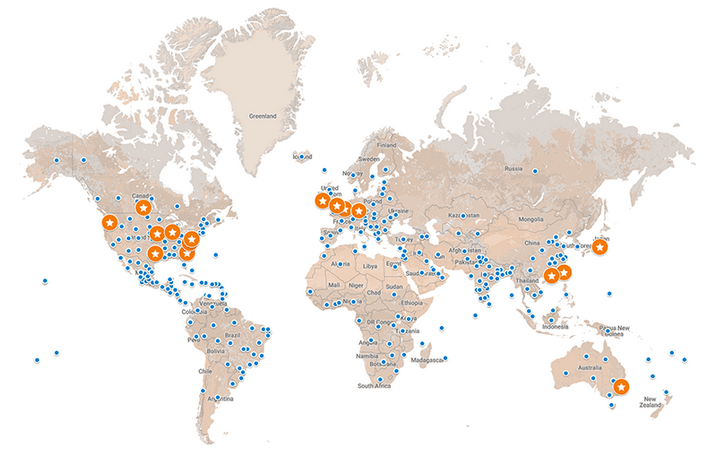 Choose from any number of data centers in the United States, EMEA, or Asia-Pacific region. This, in addition to the global CDN network all WP Engine users have access to, ensures your site visitors experience nothing short of blazing fast page loading. Plus, this exceptional performance helps improve your site’s SEO and conversion rates thanks to the great user experience. Speaking of website speed, WP Engine does not mess around when it comes to providing you the fastest platform available for your website. In fact, they boast 15.75% page speed improvement, a 5.70% increase in customer retirement, and 32.36% more revenue retained because of their speed systems and technology. They even have their very own speed tool for testing your site’s speed. EverCache Architecture. Never experience a crashed website because of a large spike in traffic thanks to the EverCache technology that handles major traffic, caches everything as it changes, and scales according to your website’s needs. 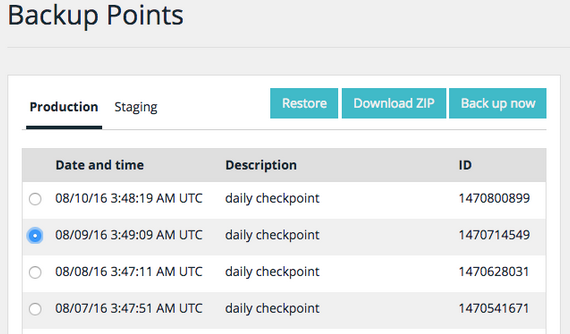 You will never need a caching plugin again because EverCache has you covered. Full-Managed CDN. In addition to the EverCache technology, WP Engine offers an optional, fully managed CDN that serves static content to your site visitors from data centers located all around the world. NGINX Extension. Prioritize human requests over automated system requests like those from bots so that not only is your website delivered quickly to those who are real and wanting to see your content, your user experience stays in tact as well. WP Engine focuses on real site visitors and doesn’t waste time on bots. WP Engine’s Page Performance feature is an integrated page speed performance tool built into the WP Engine dashboard. It gives website owners an easy way to check speed and performance insights, as well as ways to make actionable improvements for any areas on their website lacking in the speed department. Understanding how your site works from the inside out is valuable to making the exterior blazing fast and seamless when it comes to rendering. WP Engine offers many ways to protect your website’s data from outside threats. After all, keeping your hard work safe is a hallmark feature for any reliable managed hosting provider. Threat Detection and Blocking. The WP Engine platform continuously monitors your website for attacks and locations that may indicate an attack is on the way. Many of these attacks are automatically blocked and you are never the wiser since your website continues to run perfectly. Web Application Attacks. Whether at the nginx layer or within your WordPress website, WP Engine is dedicated to blocking web app attacks. Plus, they patch issues as they arise. Proactive Patching. Anytime the WordPress Foundation releases a WordPress security patch, WP Engine makes sure you receive it. By proactively managing security threats, the chances of anything happening to your website are slim. In addition, WP Engine experts sometimes create their own plugin or patch that serves as an added security measure, which of course, you receive as well. Lastly, and probably most importantly, WP Engine offers free hack fixing if your website receives threats and needs some TLC. This is an incredible feature that not many managed hosting providers are willing to offer. Being able to grow with your hosting provider is important. And, you don’t want it to be difficult to upgrade hosting plans. With WP Engine, you don’t need to worry about hassling with your website if it becomes more successful overnight. In fact, they make scaling your website for traffic growth, and allocating additional infrastructure for unplanned traffic spikes, a cinch. For instance, even the most basic plan offered is good for 25K monthly visitors. This means that even when you are just starting out, your hosting provider has the means to handle a large increase in site traffic. Staging Area. Create a clone of your website in a subdomain and make changes to your site before going live to ensure it functions properly. Then, easily roll over your changes to your live site for everyone to see. PHP7 Ready. Utilize the most current PHP version and get the most out your site’s speed. In fact, PHP7 is nearly twice as fast as any other PHP version. SSL Certificates. Protect your site visitors’ personal information with WP Engine’s free SSL certificates and renewals. Content Performance. Use WP Engine’s exclusive Content Performance plugin and integrate your site’s raw data with your Google Analytics account for further investigation on how your site is performing for site visitors in real-time. GeoIP. Dynamically deliver content to site visitors based on their geography. Large FS. Integrate your AmazonS3 account with the WP Engine platform and enjoy unlimited media storage. It is best to keep in mind that not all of the features here are available for those using the lowest priced hosting plan. Make sure to check WP Engine’s plans for a list of all the features each plan provides users. WP Engine prides itself in providing 24/7/365 support to any client with any hosting plan. Get in touch with WP Engine’s WordPress experts via live chat or email. In addition, access a secure ticket system or phone support if you have a pricier hosting plan. As far as documentation is concerned, WP Engine has what they deem the Support Garage, which has plenty of articles for troubleshooting issues. You can also access the FAQ section and get answers to some of the most commonly asked things about using WP Engine. Though for some the price points seem high, you must consider all of the features that come with utilizing WP Engine. For instance, as I mentioned earlier, the most inexpensive plan allows up to 25,000 unique visitors a month meaning it can power a lot of traffic from the start. Plus, they offer a risk free 60-day trial so you can see if their services are what you are looking for. In short, WP Engine is an excellent option when it comes to managed WordPress hosting. Especially for those that have a lot of site traffic that needs managing. If you are looking for a reliable hosting provider that offers top notch service when it comes to speed, security, and scalability, as well as support, WP Engine is definitely worth trying. They are one of the big players in the WordPress hosting industry, and for good reason. Don’t forget to use our WPEngine coupon code “meridian30” to get 30% off. They are reliable when it comes to your website and dedicated when it comes to you. Both of these make the perfect combination when it comes to building a successful WordPress website. Have you ever used WP Engine for your managed hosting needs? I would love to hear all about it in the comments below. Thanks for telling us about WPEngine and all their features. I’ve been with Hostgator for a while now and haven’t had any issues. But it’s always good to have a back-up plan, just in case. ;).